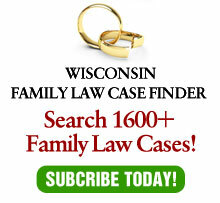 Perhaps I am the only one in Wisconsin who reads the joint custody statute this way: It is NOT really joint custody – it is severable custody. In other words the statute does not require the parties to act jointly, but specifically authorizes them to act separately. Today, the CA in an unpublished, but citeable, opinion, upheld a contempt finding against a mother who transferred school districts for the children without the father’s permission. Clearly, this was not the right thing to do, but did it violate the statute warranting a contempt finding? Under Wis. Stat. 767.001(1s), a court that gives joint legal custody of a child is ordering both parties to share legal custody, such that neither party’s legal custody rights are superior, except as otherwise provided in the divorce judgment, and, as we have discussed, all legal custodians have the right and responsibility to make major decisions concerning the child, including choice of school, except as otherwise provided in the divorce judgment. 767.001(2)(a), (2m). (Emphasis added). No where in the statute does it require her to get the father’s consent. Rather, it specifically gives her (and the father) the right to make major decisions. Although she did not do it appropriately, how is she in contempt? The answer is that the court is reading the statute the way they think it should be worded rather than the way it is worded. On the good news side, this is fodder for my column – I’ll post a link to it when it’s published.